Who is eligible for Books with Wheels service? 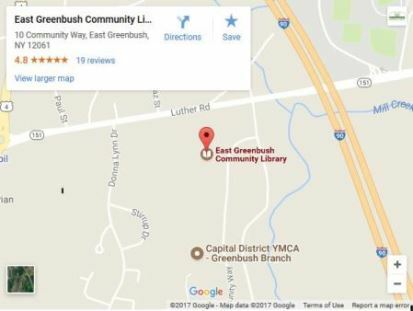 Residents of East Greenbush and Schodack who are temporarily or permanently unable to visit the library in person are eligible. Once we have received your application, we will schedule your first delivery. A Books with Wheels volunteer will bring you a tote bag of 5-8 large print books that match your reading preferences. We will arrange a mutually convenient date and time – approximately a month later – to collect your completed bag and deliver another. May I request certain books or authors? We cannot guarantee the availability of specific titles or authors, but we will gladly accommodate requests whenever possible. No, Books with Wheels is offered free of charge. How can I receive other types of materials? The New York State Library loans audiobooks and magazines to eligible individuals through the Talking Book and Braille Library program. We would be happy to assist you in applying for access to this free program. For more information, call the Talking Book and Braille Library at 518-474-5935. Because DVDs have a shorter loan period than other items in the collection, we cannot include them in the Books with Wheels program. We will mail a library card application to you. The application must be filled out and returned to the delivery volunteer at your first scheduled delivery. You will also need to show the delivery volunteer your driver’s license or other picture ID and a utility bill or other document indicating proof of address. We will deliver your new library card at the next delivery time. All materials, excluding “Stories to Go” kits, may be returned in the drive-thru book drop 24 hours a day, 7 days a week. To pick up materials at the book drop, please call the library at least 20 minutes ahead. The library has meeting rooms that can be reserved for public use. See the full policy or reserve a room. A notary is available during some of the hours the library is open. Please call ahead to ensure availability. Large print books and audiobooks are available for those who find conventional print too small to read easily. Low-vision equipment is also available for magnification of print materials. Inquire at the Reference Desk. The New York State Library’s Talking Book and Braille Library is a free service for eligible residents of upstate New York who are unable to use standard print materials due to a visual or physical disability. Materials are mailed to and from library patrons at their home at no charge. Eligible residents must fill out an application (http://www.nysl.nysed.gov/tbbl/apply.htm) and have it certified by a medical professional or a librarian. An English for Speakers of Other Languages course is offered by Questar III BOCES here in the library. For Summer 2016, classes begin on Wednesday, July 13 and are held Monday and Wednesday mornings from 9:00-12:00. Contact Questar III BOCES at (518) 273-2264 ext. 7051 or email adulted@questar.org for more information or to register for the course. More resources on our Employment and Education page. Registration and Absentee Ballot Applications & other voting information are available in the library. General election information: eVoters Guide is available at: www.lwvrc.org by the League of Women Voters of Rensselaer County. The library has three ChargeTech device charging stations in the library. One is located in the seating area next to the music in the main library, another is in the Teen Area, and the third is the Parenting section/playroom. The devices have attached cords for most types of devices. They also have USB and standard electrical inputs if you have your own cord or want to plug in a laptop, camera, or other device. Please do not leave your device unattended while it is charging. The library maintains public computers for patron use. Each patron is entitled to 2.5 hours of computer use per day. Guest passes are available for purchase ($1) by non-cardholders with picture ID. A guest pass is good for 2.5 hours of computer time is a single day. Users must abide by the library’s Internet Use Policy. Laptops are also available for in-house checkout, and are not managed by PC Reservation. Children’s Area – 3 public internet computers (Windows 10), 2 non-internet game stations (AWE). All library computers include Microsoft Office 2019 (Word, Excel, PowerPoint, Publisher), Adobe Reader, Mozilla Firefox, Google Chrome,and Internet Explorer. Computer access is managed by PC Reservation and printing is managed by LPT:One. Floppy drives are available for checkout at the Reference Desk. For more information, please see our Computer Help brochure. Download the Public Computer Help brochure for more information. For your security, a document may be saved temporarily to the computer/laptop, but will be automatically wiped when the session is over. You may email a document to yourself or a flash drive to save it more permanently. Programs may not be installed on library computers, and CD burning is disabled. A self-service photocopier is available for public use, located in the Business Center behind the Reference Desk. The charge is $.15 per side for black & white copies and $.50 per side for color copies (cash only). Duplexing (double-sided copies) is available for both color and B&W. The copier also has the ability to scan color or black & white to an email account. There is no charge to scan documents. A self-service fax machine is also available for public use, located in the Business Center behind the Reference Desk. The machine accepts credit or debit cards ONLY (Visa, MC, Amex, Discover). The Domestic rate is $1.75 for first page, $1.00 for each additional page. International faxing is also available. Incoming faxes are not accepted. Check on your fax status or resend faxes via the Fax24 website. Anyone with a wireless device is welcome to use our wireless network, provided they agree to our Internet Policy. There is no time limit for usage. Please use discretion when using the library’s wireless network, as it is unsecured. Headphones must be used with wireless devices, and they are available for checkout at the Reference Desk or purchase at the Circulation Desk. Wireless printing is also available. To connect, search for a wireless network named “EG Public WiFi.” Once connected, open your internet browser (Internet Explorer, Safari, etc.) if it does not open automatically. Instead of seeing your usual homepage, you will be redirected to our wireless portal. Click to agree to our Wireless Network Access Policy, and you will be forwarded to your homepage. If you receive an error, try manually entering a page (such as uhls.org) directly into the browser’s address bar and press enter. This should prompt the wireless server to redirect you to our portal where you can agree to our wireless network policy and gain access. The Kill A Watt™ EZ power meter is designed to easily measure how much electricity is used by plug-in appliances at home. The library has 2 of these meters available to borrow. Find out how much money you would save in your energy bills by using “smarter” home energy management! Available to East Greenbush and Schodack residents only.